(b Paris, 2 Nov. 1699; d Paris, 6 Dec. 1779). French painter of still life and genre, in which fields he was one of the greatest masters of all time. (His forenames have traditionally been given as Jean-Baptiste-Siméon, but the ‘Baptiste’ seems to have been a scribe's error, and Jean-Siméon is now the accepted form.) He was the contemporary of Boucher and he briefly taught Fragonard, but his work is a contrast to theirs in every way, representing the naturalistic strain—influenced by 17th-century Dutch painting—that ran through 18th-century French art alongside the more fashionable Rococo style. Almost all his pictures are modest in size and simple in subject, depicting objects and scenes from everyday middle-class life, and they create their magic through an extraordinarily subtle mastery of composition and colour, tone and texture (he was a notoriously slow and fastidious worker). He studied under two history painters, Pierre-Jacques Cazes (1676–1754) and Noël-Nicolas Coypel, but he gained little from them and seems to have been more or less self-taught in his specialities. In 1728 he was received into the Académie Royale as a ‘painter skilled in animals and fruits’. It was customary for new members to give an example of their work to the Académie and Chardin presented two pictures—The Rayfish (c.1725) and The Buffet (1728), both now in the Louvre, Paris. The Rayfish is, by Chardin's standards, an unusually flamboyant work: the gutted fish has a strangely human-like ‘face’ twisted in a macabre grimace, and its raw flesh is depicted with virtuoso skill. For the rest of his life Chardin was a dedicated member of the Académie: he punctiliously attended its meetings and for almost twenty years he served as treasurer (1755–74), a position to which he was well suited, as he had an exemplary reputation for honesty and integrity. He reached his peak of esteem in the 1750s, when Louis XV granted him an annual allowance (1752) and gave him lodgings in the Louvre. In spite of royal favour, he led a life of uneventful dedication to his art: apart from short visits to Versailles or Fontainebleau, he is never known to have left Paris.Chardin's career can be broadly divided into three phases, plus an epilogue. In the first phase, up to about 1733, he painted mainly still lifes, generally featuring dead game or kitchen utensils; in such works he goes far beyond matter-of-fact realism and through his simplicity and directness of vision achieves a sense of deep seriousness, in spite of the humble objects he portrayed. For about the next fifteen years he concentrated on genre scenes; they usually contain only one or two figures, and like his still lifes are completely without sentimentality or affectation (The Young Governess, c.1735, NG, London, and other versions; he often produced replicas or variants of favourite designs). 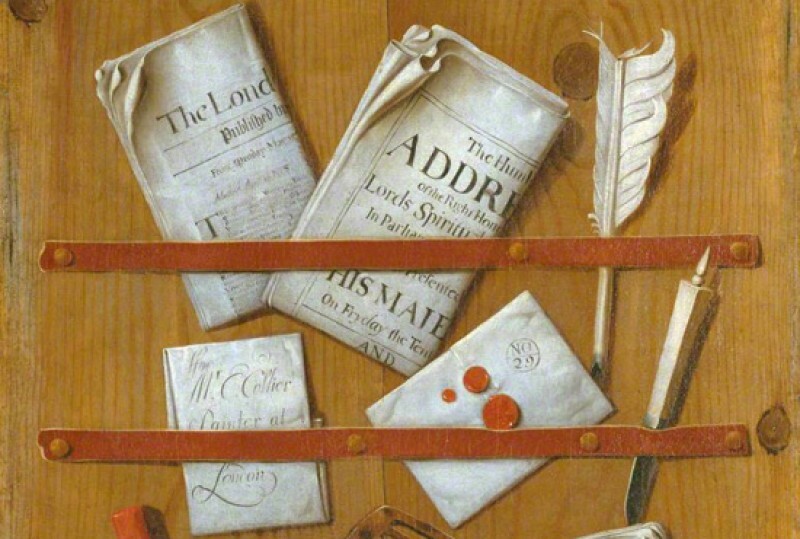 In the late 1740s he returned again to still life as his main subject, often depicting more elaborate and costly objects than he had in his early career (The Attributes of the Arts, 1766, versions in Hermitage, St Petersburg, and Minneapolis Inst. of Arts). Finally, in the 1770s he abandoned oils (evidently because the lead in certain colours aggravated an eye complaint) and took up pastel portraiture. Although he had rarely painted portraits before and had no previous experience of pastel, he immediately showed that he was a match for any of the great contemporary specialists in the field. He exhibited pastels at each of the Salons from 1771 to 1779, the year of his death; they included several self-portraits and pictures of children and fellow artists. In spite of acclaim for these unexpected products of his old age, by this time Chardin was regarded—with the growing taste for Neoclassicism—as something of an ancient relic, and after his death he was quickly forgotten. His reputation revived in the mid-19th century, when his integrity and directness impressed the exponents of Realism. Subsequently, the formal strength and masterly technique of his paintings have appealed enormously to modern taste, and he is now one of the best-loved artists of the 18th century and perhaps the most revered of all exponents of still life.